I recently watched a video where I learned that, in 1936, a J-35 had a list price of $35.00 and an Advanced Jumbo was valued at a whopping $80.00. Adjusted for inflation today, those two guitars would cost $636.49 and $1454.83, respectively, bearing in mind that the AJ was the crown jewel of the Gibson lineup, at that time. A 2018 J-35 (complete with plastic nut, saddle, and bridge pins) will set you back $1,869.00, new, at Guitar Center, while the AJ will cost you considerably more, if you can even find one retailing new. A J-15, complete with walnut back and sides and a laminate maple neck, retails at $1340.99 at GC, while a walnut b&s "J-45" will set you back $1,529.00, at the same store. All that being said, I'd like to ask, what gives? Is Gibson (along with the rest of the industry) pulling the wool over our eyes and overcharging its customers? If a shortage of tonewoods and American manufacturing standards are to blame, then how does one explain Seagull guitars being made in Canada with North American woods, at a considerably lower price? Really KS? That's interesting. Explain further? Here is a chart I did about ten years ago. 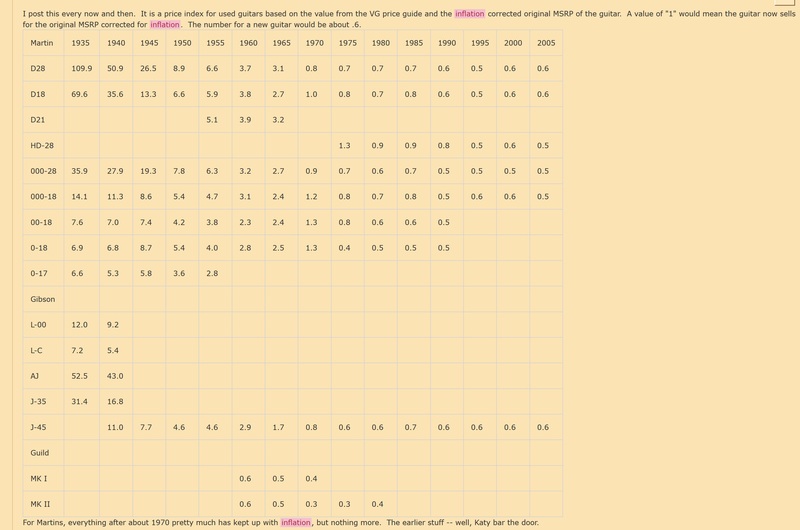 It tracked the retail prices of vintage Martins -- after inflation -- for different models from different years in 2010. Vintage Guitar Price Guide was the source of the vintage model's retail price. It is an index -- value after considering inflation (US gov numbers). So it says a 1935 Martin in 2010 is worth 109.9 times as much as the original retail price. The is REAL value increase -- corrected for inflation. I have the numbers for Gibsons too -- I'll try to find them. So, just buy a Seagull. Yes, there must be a vast conspiracy between Gibson, Martin and Taylor to keep guitar prices artificially high, since there is no competition from anyone else. Except for all the other companies that build guitars in the US and other countries. It's your money, and your choice of how to spend it when it comes to buying a guitar. There are lots of options. No one is forcing you to buy a Gibson or Martin at these ridiculous prices, and yet...people buy them. Lots of people. If you think they're ripping you off, buy something else. I’ll answer the poll right after I finish going to a dog show and tell them why I like cats. Post like this make me laugh. Do you like your wages or would you like to be paid in 1935 dollars? away benefits from worker you better ask the government to lower the amount of taxes taken off theis pay check. Or you could just buy a guitar you can afford. For the guy who only has $999 Gibson is coming out with the G 45 . There were still people in the 1930’s who couldn’t afford Gibsons and those people would buy Stellas .A lot of people who can’t afford a Gibson in the modern era think that by trashing the brand and saying that they are “overpriced” it will make Gibson magically lower the prices. If you want a Gibson start saving up . If you can’t afford a Gibson well there are other companies who make great guitars at more affordable prices. Ha Ha Some great answers guys. funny stuff. Yeah why would some person join just to post that? The weather in 1936 was so much better than it is today. Why can't we have 1936 weather? I've played the guitar since I was 14 years old. I am now 62. I waited 36 years to own my first Gibson - a 2006 Songwriter. During those intervening years, I played Yamaha, Dean, Epiphone and Larrivee; all good guitars but not as good as a hand-Boseman-built Gibson in my subjective opinion. I now own three top of the line acoustics; SJ200 Golden Age, Custom Shop Hummingbird 12 string and a Martin 000-28vs. I was able to get those guitars through years of trading up, two for one and saving and budgeting. Are they over-priced? No. Pricey? YES! Worth it? YES! Oh good lord, folks. I get that you have to drink the Kool-Aid to a certain extent to belong here, but the IQ of some of these posters might be dipping into the low-80's, from what I can tell. Anywho, I'll say my peace, before I bid thee all fond adieu: I'm not "trashing" the brand, nor do I want to return back to "1936 Weather", like Albert Einstein suggested before me. (Nor do I want to strip the good old Bozeman boys and their CNC machines of their healthcare benefits...what a strange comment to make). I just came to point out that, maybe, just maybe, Gibson guitars are overpriced. You can delude yourselves about the perceived value of these guitars until kingdom come, but, ultimately, as consumers, you are being taken advantage of. There is nothing magical or special about a Gibson guitar's manufacturing process that warrants charging triple of what Godin does. This is pretty much a cold, hard incontrovertible fact when you consider the Gibson lineup outside the Custom Shop. Granted, I'm not a fan of how Seagull guitars are voiced (a matter of taste), but, if anything, their existence proves that high-quality, solid-wood guitars can be made in North America at a fraction of what the big three are charging. I genuinely love Gibson guitars. I think they sound great. I even prefer them to Martin's and Taylor's. In fact, I love Gibson so much that I wish to see the brand survive after its bread and butter of gullible, oh-so-exploitable, pension-cashing baby boomers meet their end. It would be a shame if Gibson died out with them, having failed to tap into a market of young, burgeoning guitarists who lack the 1.5k needed to buy a decent-sounding, American-made, solid-wood Gibson guitar, at retail price. As has been stated, the cost of human labour has grown exponentially (and beyond the rate of inflation) over the timeline you set out. This has a knock-on effect on the cost of living, the cost of material supply and several other factors. Gibson guitars ARE expensive, but so are Martin's, Taylors and just about any other brand with high end instruments making up the majority of their line. Have you done the same price Vs interest rate comparison with Martin guitars? I'd love to know the results and how they compare. The comparison with Seagull/Godin/Art & Lutherie instruments isn't really a fair one. Their guitars are fine, but are relatively cheaply made guitars with laminate back and sides, inexpensive thin finishes etc etc. Great within their price point, but it's a bit like comparing a moped to a Mercedes. Both will get you from A to B, but I know which I'd rather use. I'm not sure I get your point about the "laminated neck" of the J15, I also have a laminated neck on my SJ200 and have had them on Doves and other high end instruments, it's a design feature for strength and appearance rather than a cost cutting measure. Or maybe it was Oscar Wilde who said it. Or Will Rogers. Or an adman for Head & Shoulders shampoo. Interesting that the OP would hold up two Canadian companies, Godin and Seagull, as great examples of guitars that are cheaper than Gibsons. I'd be interested to know how much Godin and Seagull have to contribute a year to their employees' healthcare. Oh, wait -- they're Canadian, so that's not an expense they have. Gibson does. And Gibson has other expenses of doing business in America. (And we can save the whole debate on living wages, taxes, etc., for later.) The bottom line is, Gibson builds in America, so they have those costs of doing business and companies have always passed those costs along to the consumer. I'll note he didn't throw in Fender's acoustics, most of which are made in the North American country of Mexico. When Fender announced in January that it was going to start selling a U.S.-built acoustic, the American Acoustasonic Series Telecaster, it said it was going to cost about $2,000. That's $400 more than what I paid for my Gibson J-35 in 2016. One is an iconic slope-shoulder guitar from one of America's oldest guitar builders, while the other is an "acoustic" guitar for people who don't like acoustic guitars. Apologies to Seagull, Godin and Fender acoustic owners, but Gibsons just tend to be better guitars. Nobody is forcing anyone to buy a Gibson. If you don't think they are worth the money, don't buy them. Those other guitars may be nice, and you may find an occasional great one, just like you'll find an occasional Gibson that still thinks it's a tree. But my experience is that Gibsons are worth it. I can't believe this is a discussion we're wasting precious brain cells on. is a lesson that only comes with a age. Just like the sound of a vintage guitar. I recently had a hankerin' for the sound of a Les Paul again after getting rid of my old girl to Norm's Guitars. Did I fork out 3k for a new electric? Hell no! I spent $439 for a Korean copy. First off let me start by stating I love my Martins just as much as my Gibson’s so no bashing going on from me. This does seem to be a trolling excercise. For a first timer he seems to know what buttons to push. Probably a previously excumminicated member trying to stir the pot. Using his reasoning, a new BRW 1942 D45 listed at $250. That would be $3877 in today’s dollars. I’ll take a dozen of them.